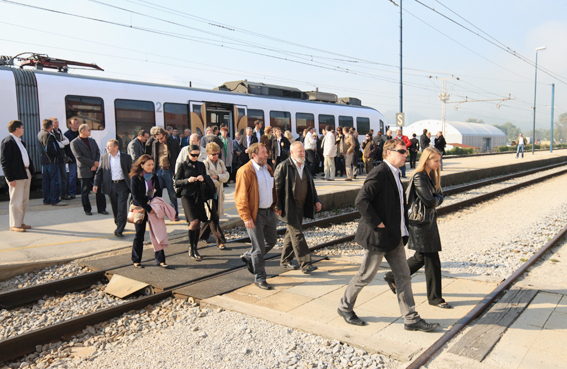 RAILWAY TRANSPORT, SLOVENIA: SŽ continually adapt their services to the modern consumer, who demand more than just transport from point A to point B. With the envisioned revitalization of railway stations and an ever expanding offer of extra activities the railway passenger traffic will become he backbone of the public passenger traffic. The passenger services company SŽ - Potniški promet, d. o. o. provides the inland and international transport of passengers and offers many attractive possibilities for private and official journeys by train. More information on the offers is available in the sections on international transport and inland transport. The cargo transportation company SŽ - Tovorni promet, d. o. o. offers the transport of goods in Slovenia and abroad, and not just on the railway but also in combination with other types of transport. More information is available on the pages of freight transport. The infrastructure company SŽ - Infrastruktura, d. o. o. takes care of the running and general repairs of the Slovenian railway infrastructure, and of railway traffic management. More information is available in the section on infrastructure.